Paris: Plon, 1922. Fine. Plon, Paris 1922, 12x19cm, broché. 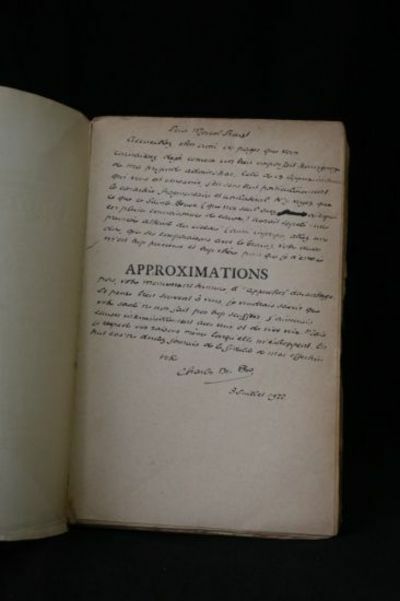 - Edition on paper courant.Exceptionnel autograph dedication of the author signed autograph of the author Marcel Proust: "For Marcel Proust / welcome, dear friend, these pages you already know as a very imperfect expression of my deep admiration / Which of these approximations. you devoted, I feel particularly the fragmented and unilateral. / Do not see what Sainte-Beuve (you only have criticized knowingly) would have called "a first attack with scissors" (also improper, you will say that its comparisons with chisel). / me Your cause is too precious and too expensive so I did not test, your monument completed, "approaching" more. / I often think to you, I want to know that your health does not make you suffer too much, I love you and cause endless orally. / But I respect your reasons even when they escape me. / In no case never doubt of the loyalty of my affection. / Your Charles du Bos July 3 1922 "A small marginal spot on the first board, two small tears stuck back in the back foot, with a few leaves not cut small tears and moving marginales.Unique copy. --- Please note that the translation in english is done automatically, we apologize if the formulas are inaccurate. Contact us for any information! - [FRENCH VERSION FOLLOWS] Edition originale sur papier courant. Exceptionnel envoi autographe signé de l'auteur à Marcel Proust : "Pour Marcel Proust / accueillez, cher ami, ces pages que vous connaissez déjà comme un bien imparfait témoignage de ma profonde admiration. / Celle de ces approximations qui vous est consacrée, j'en sens tout particulièrement le caractère fragmentaire et unilatéral. / N'y voyez que ce que Sainte-Beuve (que vous seul avez critiqué en pleine connaissance de cause) aurait appelé "une première atteinte au ciseau" (aussi impropre, allez-vous dire, que ses comparaisons avec le burin). / Votre oeuvre m'est trop précieuse et trop chère pour que je n'essais pas, votre monument terminé, "d'approcher" davantage. / Je pense bien souvent à vous, je voudrais savoir que votre santé ne vous fait pas trop souffrir, j'aimerai causer interminablement avec vous et de vive voix. / Mais je respecte vos raisons même lorsqu'elles m'échappent. / En nul cas ne doutez jamais de la fidélité de mon affection. / Votre Charles du Bos 3 Juillet 1922." Une petite tache marginale sur le premier plat, deux petites déchirures recollées en pied du dos, quelques feuillets mal découpés avec légères déchirures marginales. Unique et émouvant exemplaire. London: J. M. Dent & Sons,, 1922.. 6 volumes, octavo. Bound by Bayntun in red half calf, red cloth sides, green and brown morocco labels, spines richly gilt, top edges gilt, marbled endpapers. Coloured frontispiece by Dulac to each volume, 54 similar plates in all. Boards gently bowed, light spotting to edges, leather slightly scuffed. An excellent set. 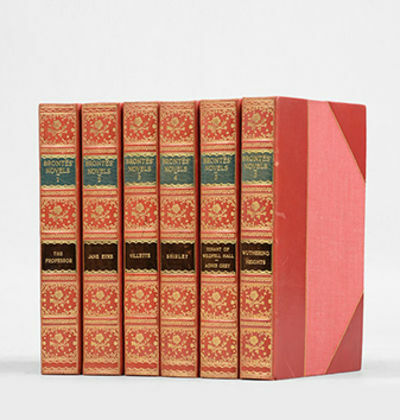 An attractively bound set of the Brontë sisters' novels. Fortunio. Mit Original-Lithographien von Werner Schmidt. Der Zirkel,: Berlin:, 1922. Berlin: Der Zirkel, 1922. A profusely illustrated monograph on the first Berlin subway system, now referred to as the "U-Bahn." The system, which ran above and below ground, was built and operated by a private company, which inaugurated service in 1902 and continued until its sale to the city in 1929. Paul Wittig, who began his career as an architect, lead the company during this entire period. The first phase of development took place between 1897 and 1913. Wittig commissioned several architects for different parts of the system, but the Swedish architect Alfred Grenander was responsible for most of the notable design work. Grenader was employed on all types of structures, working predominantly in a Jugendstil fashion, although some neo-classical designs were also included. Wittig's massive and luxurious monograph celebrates the impressive accomplishments of the first phase of development at the point where work was about to resume again, but under much greater financial restraint. It provides impressive documentation of one of the most architecturally ambitious European public works projects of the early twentieth century. Scarce, OCLC locates only 8 copies, of which 4 in Germany and 3 in North America (Huntington, Michigan and Art Institute of Chicago). Folio (45 x 33 cm); 8 ff. + 26 + (2) + (4) + (5) +(4) + (4) + (5) + (4) + (3) + (2) pp. with text illustrations + 68 plates. Original printed paper-covered boards with leather spine, worn; board edges repaired with heavy cloth tape; occasional light smudges in margins. Maria". Typescript poem (carbon copy) with autograph corrections, signed ("bertbrecht") and dated. N. p., "weihnachten 1922". - 1 p. Folio. "Maria | die nacht ihrer ersten geburt war | kalt gewesen | in späteren jahren aber | vergass sie gänzlich | den frost in den kummerbalken | ochsenpissegeruch und rauchenden ofen | und das würgen der nachgeburt gegen morgen zu | aber vor allem vergass sie die bittere scham | nicht allein zu sein | die den armen eigen ist | hautsächlich deshalb | ward es in späteren jahren zum fest bei dem | alles dabei war | das rohe geschwätz der hirten | verstummte | später | wurden aus ihnen könige in den geschichten | der wind der sehr kalt war | wurde zum engelsang | ja von dem loch im dach das den frost einliess blieb nur | der stern der hindurchsah | alles dies | kam vom gesicht ihres sohnes der leicht war | gesang liebte | arme zu sich lud | und | die gewohnheit hatte unter | königen zu leben | und einen stern über sich | zu sehen zur nachtzeit". - One of the most significant poems of his early times, retelling the Saint Luke's Christmas story. - The corrections in pencil, signature and date in ink; slightly browned and stained; some defects to edges. Berliner und Frankfurter Ausgabe, Bd. XIII, p. 243; First Print (with deviations from the typoscript) in "Berliner Börsen-Courier" (25. XII. 1924). 1922. FURUKAWA, Umejiro. Azumanishiki. Illustrated with 50 colour woodblock prints. Oblong 4to., 213 x 305 mm, bound in original illustrated boards sewn Japanese style, in a new brown shitzu case. Tokyo: Azumanishiki Hakkojo, 1922. |~||~||~||~| An illustrated catalogue of wagashi, Japanese sweets crafted into edible artworks. "Wa" signifies Japanese and "gashi" refers to confections. These finely coloured woodblock prints depict various types of morsels: squares, mounds, and dollops, decorated with patterns inspired by elements of traditional Japanese culture found in nature, seasonal events, paintings, textiles, and literature. One treat features an image of a rabbit holding a mallett, a reference to the "Moon Rabbit" myth of rabbits making mochi on the moon. With text descriptions on facing pages. OCLC finds only one copy, in the National Diet Library. Toronto: McClelland & Stewart Limited 1922, 1st Canadian reprint. () 346pp. Near fine in very good dust jacket. Octavo. Publisher's blue cloth. Dark blue title on spine and front board. Textblock all trimmed. A very clean copy. Dust wrapper is basically intact with minor wear at the tips and an old closed tear at the top of the front hinge. Old tape stain showing through covering part of the title. Jacet has had a bit of professional restoration. A pleasing copy. Inscribed across the fron free endpaper Your cordially L.M. Montgomery. Also tipped onto the front pastedown is an early black and white, 10.5 X 7 cm. Snap shot of Montgomery's house on P.E.I. The previous owner has also cut out the portrait of Montgomery on the front flap and pasted it below the signature. Russell 302. See Editions and Impressions. A wonderful copy especially signed and with the contemporary photograph..
Paris: Clarte, 1922. First Edition. Wraps. Very Good. Unsettling Dada-esque cartoons to satiric text, mocking the lead-up to the war, the war itself and its aftermath. 4to. Oblong, 25 by 27 cm. Unpaginated, 51 pp. The imagery is blunt and highly economical; its impact is harrowing and disturbing. The images come across deliberately like pieces of a puzzle, with the text written out as if by a very thick nib to look almost like graffiti. Loforge assiduously avoids the pretty and polished as he is portraying the ugly underside of society throughout. His use of long hand to elucidate the imagery is in keeping with what other surrealists were doing at the time. Here and there letters are deliberately dropped from words as if to elude a censor.Heavy age toning, as per the cheap paper that was used. Otherwise, clean. A monumental work of statement art in book form. 1 page of a bifolium. Octavo. Dated MÃ¶dling, near Vienna, June 17, 1922. With Schoenberg's address handstamped to upper left corner. In German (with translation). "Without concern for the fact that he who gives soon gives twice, you have given the double amountÂ—that is, fourfoldÂ—and you are announcing to mobilize others. That is very nice of you, and I am very glad to have taken the courage to turn to you [already] after such a recent acquaintance, and I see my trust rewarded in the most beautiful way." Creased at folds; hinged at upper edge with archival tape. . Unpublished (except for the incipit on the website of the Arnold SchÃ¶nberg Center, Vienna). The present letter follows Schoenberg's first letter to Otto Freund, a banker in Prague, sent on June 9, 1922 (held at the Arnold SchÃ¶nberg Center). In his earlier letter, Schoenberg had asked for finanical assistance for Anton von Webern, who at the time was in great financial need. Freund sent 250,000 Austrian crowns; see his letter of June 15, 1922 (at the Library of Congress). London: George Newnes Limited, , . Octavo. Original red cloth, titles to front cover and spine in black. Illustrated by Thomas Henry. Spine rolled and faded, a little minor foxing to edges and endleaves, a couple of minor stains to boards, small dent to front board. A very good copy. First edition, first impression of the first William book. (Yokohama Nursery Co.): Yokohama:, August 1922.. Yokohama: (Yokohama Nursery Co.) August 1922.. The Yokohama Nursery Company was one of the largest suppliers of Japanese lilies and other Japanese plants and bulbs to the Western nursery trade. Accompanying this color catalogue from the company is a color decorated price list giving the export company's British address at "Craven House Kingsway,/ London. W.C. 2". The catalogue itself is a handsome survival. " The Yokohama Nursery Company catalogues from the mid-1890s through the mid-1920s are impressive documents, written in English and beautifully illustrated with colored plates..." (ARNOLDIA 64/23, Del Tredici. " From Temple To Terrace" p. 4). Of the lilies themselves, there are 44 illustrated examples distributed at 3 or 4 to an oblong page over 12 plates. The list begins with Lilium auratum, then Lilium Henry1, Lilium tigrinum Fortunei Giganteum, etc., including Fritillaria kamchatensis and Thunbergii. The price list indicates size, case lots and costs per 100 bulbs. " Free London Wharf. Guaranteed Sound." The 12 plates of color lithographs in the text are in vibrant colors with brief captions identifying each variety. The separate price list features an attractive color illustration of lilies along the lower left half of the sheet. OCLC lists 7 copies in the U.S.; 1 in the U.K.Oblong folio (26.5 x 39 cm); (iv, including title and plate list) pp.+ 12 color lithographed plates illustrating 44 flowers; illustrated price list laid in.Original plain paper covers with cover title within color block design on upper cover; stabbed and tied; some minor soiling to covers; previous owner's name, " Cuningham"? with date of 1928 in ink on upper cover; a faint trace of faded old damping at upper corner of upper cover and, faintly, on top edge and corner of title page, not affecting text; some wrinkling to paper and a bit of thumb-soiling, corners bumped, but plates are rich in color and in very good condition; the mimeographed price list on thin Japanese stock has been folded in half and marked in color pencil on two lines. Collection of 17 original photographs. Mostly Calcutta, 1922. - Albumen prints (vintage). Mostly 136 x 190 mm, but some smaller (down to 121 x 90 mm). Fine, rare collection of British equestrian sports in India, mostly showing the 1922 Calcutta Races. Annotated to rear: "The Indian Grand National: 1st Hurdle", "Mr Ivan Jones 'China Egg'", "The Canal Hurdle Plate (Finish)", etc. Also shows the spectators at a Polo match, portraits of Anglo-Arabian thoroughbreds, etc. - Steeplechase racing was popular in British India both among planters and cavalry regiments. The first Indian Grand National was run at Tollygunge as early as 1895. - Well preserved. "Maria". Gedichttyposkript (Durchschlag) mit eigenh. Korrekturen, Namenszug ("bertbrecht") und Datum. O. O., "weihnachten 1922".. 1 S. Folio. Durchschlagpapier.. "Maria | die nacht ihrer ersten geburt war | kalt gewesen | in späteren jahren aber | vergass sie gänzlich | den frost in den kummerbalken | ochsenpissegeruch und rauchenden ofen | und das würgen der nachgeburt gegen morgen zu | aber vor allem vergass sie die bittere scham | nicht allein zu sein | die den armen eigen ist | hautsächlich deshalb | ward es in späteren jahren zum fest bei dem | alles dabei war | das rohe geschwätz der hirten | verstummte | später | wurden aus ihnen könige in den geschichten | der wind der sehr kalt war | wurde zum engelsang | ja von dem loch im dach das den frost einliess blieb nur | der stern der hindurchsah | alles dies | kam vom gesicht ihres sohnes der leicht war | gesang liebte | arme zu sich lud | und | die gewohnheit hatte unter | königen zu leben | und einen stern über sich | zu sehen zur nachtzeit". - Eines der bedeutendsten Gedichte aus Brechts früher Zeit, in dem er umdeutend die Weihnachtsgeschichte nach Lukas 2 erzählt. - Die Korrekturen in Bleistift, U. und Datum in Tinte (leicht verlaufen); leicht gebräunt, schwach stockfleckig und recht knittrig; kleine Randläsuren (rechter Rand mit Klebefilm hinterlegt). - Berliner und Frankfurter Ausgabe, Bd. XIII, S. 243; Erstdruck (mit Abweichungen von unserem Typoskript) im Berliner Börsen-Courier vom 25. XII. 1924. Die Große Politik der europäischen Kabinette 1871 - 1914. Sammlung der Diplomatischen Akten des Auswärtigen Amtes. 40 in 54 Bänden, plus 5 in 8 Kommentarbänden = KOMPLETT. Zusätzlich: Zeitkalender der Diplom. Akten, v. B. Schwertfeger. Die Schriften Salomos. 2 Bände (1 Textband und 1 Tafelkassette). New York: Gabriel Wells,, 1922. The Definitive Edition. 37 volumes, octavo. Bound in near-contemporary dark blue half morocco, blue cloth sides, titles to spines gilt with gilt raised bands and decorated compartments, gilt rules to boards, top edges gilt, pale blue endpapers. Frontispieces with captioned tissue-guards. Spines faded to brown, tips a little worn. An excellent set. Signed limited edition, attractively bound. This is set number 325 out of 1024 copies, signed by Twain on the second blank; together with a statement that the leaves were signed by him in 1906 in anticipation of the present definitive edition, and further signed by Albert Bigelow Paine, the biographer noted for his work on Mark Twain. GÜTER - ADRESSBUCH FÜR PROVINZ GRENZMARK POSEN - WESTPREUSSEN.- Sowie Freistaat Danzig, Ostpr. Reg.- Bezirk Marienwerder. Verzeichnis sämtlicher Rittergüter, Güter und größeren Bauernhöfe der Provinz mit Angabe der Guts-Eigenschaft, des Grundsteuer-Reinertrages, der Gesamtfläche . Angabe der Besitzer, Pächter und Verwalter, der Post-, Telegraphen- und Eisenbahnstationen . einem alphabetischen Orts- und Personenregister, dem Handbuch der Königlichen Behörden. Nach amtlichen Quellen und auf Grund direkter Angaben bearbeitet von Oskar Köhler. Philadelphia: Privately Printed, 1922. Hardcover. VG+ The whole enclosed in a luxurious cottom-lined box which needs repairs. Luxurious 3/4 leather with moderate gilt tooling on corners, edges and within the six spine compartments (formed from the 5 raised-bands). Heavy rag cotton paper with gilt top edge and untrimmed edges. 12 cards and 1 loose, unrelated etching. This fascinating album measures 18.5" x 16" x 2". It has plain endpapers. Within it are yearly Christmas cards sent from Joseph Widener to his unknown recipients, these likely being his own keepsakes. The engravings and prints showcase artwork (apparently from his own collection) and later racehorses (presumably from his own stables, 1933 and 1934). The card for 1931 is not present. All engravings are signed by the engraver: Devitt Welsh (1922, 23 and 24); Timothy Cole (1925, 27, 28, 29, 30); A. Witherspoon (color engraving, 1926); unknown engraver (1932). The size of the cards and etchings / images varies, with the 1925 by Timothy Cole being the largest. All were mounted at one time to individual pages, and those mounts have dried and most have come loose. All are in VG+ condition. Widener has signed all of the cards except for 1924. In addition, there is laid-in loose within the album an etching of William Penn published by the Historical Society of Pennsylvania dated 1877. Paris: Shakespeare & Co.,, 1922. Quarto. Original blue and white wrappers. Pale offsetting on half-title, inscription slightly bled, old glue remains beneath inscription presumably where bookplate removed, some small losses at ends of spine, larger along the lower rear joint, a few small nicks to edges, but an unsophisticated copy. First edition, first issue, one of 100 copies on Dutch handmade paper, this copy number 41, signed by Joyce on the limitation page. A fine association copy, owned by the novelist and editor Bryher who helped finance and support numerous other publishers, including Sylvia Beach. She also gave financial support to writers, including Joyce and Edith Sitwell, and counted among her circle of friends Gertrude Stein, Ernest Hemingway and Berenice Abbott. Provenance: Annie Winifred Ellerman (1894?-1983, remnants of bookplate), known as Bryher, novelist, poet, magazine editor, and companion to the poet Hilda Doolittle (H.D.). She and her husband at the time, Robert McAlmon, befriended Joyce in Paris in 1921 and helped finance publication of Ulysses, McAlmon also serving as Joyce's typist for sections of the manuscript. The bookplate was designed by George Plank (1883?-1965) using an Icelandic theme. Bryher travelled several times to Iceland, first in 1929, accompanied by H.D. and their friend Robert Herring, editor of a literary journal Bryher financed in the 1930s and 1940s, Life and Letters Today. His pencil initials also appear on the flyleaf. The bookplate was partially torn out by H.D. during a nervous breakdown in 1946, when she and Bryher were living at Lowndes Square, London; thence by descent to the present owner. The impact of Joyce's Ulysses was revolutionary in its own time, and the book continues to stand as the single most significant English language novel of the last century. The complexities of its formal structure, its linguistic inventiveness and its imaginative cohesion of historical sources have made Ulysses the most diligently studied work of modern literature in English. Cyril Connolly, while criticizing Joyce's "preference for language rather than people," nevertheless could not reject the novel's immense intellectual weight: "somehow it does achieve greatness like a ruined temple soaring from a jungle ?- and should be judged perhaps as a poem, a festival of the imagination." The first edition of Ulysses was divided into three issues, in imitation of French practice. The first 100 copies on Dutch paper were signed by Joyce; the second 150 copies were in large paper format, though on a lesser grade of paper, and unsigned; the remaining 750 copies were on smaller and least expensive stock of paper, again unsigned. The various issues did not arrive at Sylvia Beach's bookshop in strict order, and Sylvia Beach's notebook recording copies sold up to 1 July 1922 does not list this copy as sold by that date. Chinesische Tierplastik und Tierbilder. Eine Sammlung von Beispielen. Ausgewählt und beschrieben v. H. d'Ardenne de Tizac. Berlin, Wasmuth, um 1922.. Mit 7 montierten, farb. Abb. auf 6 Tafeln und 86 Abb. auf 44 Tafeln, jeweils mit Erläuterungen auf einem vorgeschalteten Beiblatt. 6 Bl. Kl. Folio. Illustr., goldgepr. OLn., dieses etwas berieben u. mit Feuchtigkeitsfleck an der rückseitigen Oberkante, der Rücken schwach gebleicht und am unteren Kapital minimal defekt. Kopfgoldschnitt. Stempel a. d. Vorsatz, stellenweise etwas fleckig, 1 Beiblatt geknickt, die letzten Tafeln und Beiblatt im oberen Eck leicht gewellt, mit Wasser- und Farbrand. (3110 Gr.). Für Fragen stehen wir Ihnen gerne telefonisch zur Verfügung!Exemplar 98 von 200 Exemplaren. Das Werk entstand auf Grund einer Ausstellung im Museum Cernuschi (Paris) mit wichtigen Stücken aus Sammlungen in Paris, London und Brüssel. The Works. The Definitive Edition. New York: Gabriel Wells, 1922 - 37 volumes, octavo. Bound in near-contemporary dark blue half morocco, blue cloth sides, titles to spines gilt with gilt raised bands and decorated compartments, gilt rules to boards, top edges gilt, pale blue endpapers. Spines faded to brown, tips a little worn. An excellent set. Frontispieces with captioned tissue-guards. Signed limited edition, attractively bound. This is set number 325 out of 1024 copies, signed by Twain on the second blank; together with a statement that the leaves were signed by him in 1906 in anticipation of the present definitive edition, and further signed by Albert Bigelow Paine, the biographer noted for his work on Mark Twain. Regensens Rusgilde, 1922, Softcover, Book Condition: FairSize: 8vo - over 7Â¾" - 9Â¾" tall. 55 pp. Text clean and in DANISH. Small number written lightly on front free endpage. Pages lightly tanned. Wraps bumped and shelf worn at corners, edges and spine ends with some light soiling. First four pages creased at upper corner. Small closed tears to front top edge of wraps. Wraps tanned. Staples at spine rusted. Wrap becoming loose at staples but still attached. Small closed tears and chipping to spine. Quantity Available: 1. Inventory No: 106423. [Chicago] The Author, 1922, Hardback, First EditionSigned by the author with an additional signed typed letter tipped-in. Near fine copy in the original gilt-blocked cloth. Slightest suggestion only of dust-dulling to the spine bands and panel edges. Particularly well-preserved; tight, bright and clean. ; 358 pages; Description: xviii, 358 p. Front. (fold. Map) 20 cm. Subjects: Indians of North America--Wars--1862-1865. Inyo County (Calif. ) --History. Death Valley (Calif. And Nev. ). New York: Boni & Liveright,, 1922. Octavo. Original black cloth, titles to spine and upper board gilt. With the dust jacket. A bright copy in the dust jacket with just a hint of soiling to spine, touch of wear along extremities. An excellent copy. Second edition (second impression of the first edition). The colophon describes this as the second edition, but it is actually a second impression from the same setting of type as the first, with the error "mount in" on page 41 left uncorrected. A beautiful copy. CHINESE FURNITURE: A Series of Examples from Collections in France. A KEEN AND EARLY REFERERENCE ON CHINESE FURNITURE London 1922, - Benn. Black cloth, very good, 20 pages text, 54full page photo plates, 10 half-tones, 25 x 32 cm., neatlyrebacked, tissue guards on each plated, excellent clean,verysolid copy, new end papers, sharp copy! FIRST & ONLY EDITION Color scans available for this book on request. Description content 2015Copyright Rare Oriental Books Co.
Ravnitsky, I. Ch. & Bialik, Ch.N. Berlin, Zal'tsman, Saltzmann, 1922.. 2 Bände. Gross Oktav. 221, 3, 200 pp. With a frontispiece, illustrated title in woodcut and several illustrated head-pieces and vignettes. Hardcover, illustrated half cloth binding. Illustrierte Original Halbleinenbände. Etwas angestaubt, Ecken leicht bestossen und ohne die einfarbigen braunen Schutzumschläge, sonst gut. A bit dusty, corners slightly bumped, without the brown dustjackets.. Rare first edition, no reprint. Joseph Budko (1888-1940), born in Plonsk, studied at the art school in Vilna and moved in 1910 to Berlin, where he met Hermann Struck, in 1933 he emigrated to Palestine. Paris: M. de Brunoff. 1922. hb. Folio, The English edition was published a year later, by Benn Bros., in an edition of 1,000 copies, with a Preface by Andre Levinson. . Bound in the original frail stiff card covers, the front cover being printed and decorated in gilt. One of 500 numbered copies, of which this is copy number 466, signed on the limitation page by both Bakst and de Brunhoff. With 54 magnificent full-colour laid-in plates of spectacular Bakst costume designs, each protected by a captioned tissue guard, and each signed and dated in the plate by Bakst. This is preceded by a striking lithograph portrait of Bakst, rendered by Picasso, and signed and dated (1-4-22) in the plate by the artist. "The Sleeping Beauty" premiered in St. Petersburg, Russia, January 3, 1890. Despite a lavish production, and the choreography of Marius Petipa, it was not well-received, the critics and the public alike finding the music too "symphonic". It wasn't until 1921, when the Russian impressario Serge Diaghilev brought together Leon Bakst to design the sets and the costumes, and Igor Stravinsky to orchestrate the music, that the ballet was truly appreciated. Bakst's designs, in particular, were revolutionary: "Bakst's greatest claim to theatrical glory lies in his feeling for synthesis, in his impeccable instinct for harmony, which blends the innumerable elements of the performance into one, single, coherent, whole" (from Levinson's Preface). The front cover of this copy has detached, but is present. The rear hinge is weak but holding. Spine paper absent and stitching is shaken but holding nicely. No loose pages and all tissue guards are present. The plates, and the lithograph, are unblemished. C'est magnifique! . FREUD, TOM SEIDMANN. (FREUD,TOM SEIDMANN)illus. SEFER HADVARIM [A BOOK OF THINGS] [by] H.N. Bailik. Berlin: Ophir 1922. Square 8 1/4", cloth backed pictorial boards, some cover soil, tips rubbed and ribbing at inner hinges else an unusually clean, tight and VG+ copy. 1st edition of Freud's first book published by Ophir. There are 16 poems by Bialik and 16 striking full page hand-colored illustrations by Freud. Freud, whose real name was Martha Gertrude Freud, adopted the name "Tom" at age 15. She was the niece of Sigmund Freud and an innovator in early education in Germany. When Hitler came to power, her books were banned because of her Jewish heritage. That is why it is difficult to find complete copies of her later novelty books, but it is rarer still to find any copy of this picture book by her. In the introduction to the reproduction of Ten Fairytales done by the Israel Museum, it is explained that Freud married Jankew Seidmann in 1921 and he, along with Bialik, was a partner in the new publishing firm Ophir. "Clearly, all three partners involved in the venture keenly felt that they were pioneering in the creation of new, excellent Hebrew books for the young." Sadly this is one of only 2 books published by them before they broke up. A real rarity and a nice copy. Boston and New York: Houghton Mifflin Company. 1922. First. First edition. Tall thick octavo. 526pp. Blue cloth gilt. Owner's small name stamp and signature ("Charles Ashley White") on the front fly, boards a little bit smudged and worn at the extremities, a very good copy lacking the very uncommon dustwrapper. Fisher was an important American economist, who after the Great Depression was best known for his work on debt deflation. Very scarce. .
New York: Harcourt, Brace and Company, 1922 First edition, first printing, first state, with "Supposing Purdy and I" and "to ruin my fellow human" to page 49. One of 9,500 copies. Inscribed by Lewis on the front free endpaper: "To N. N. Wallack / Sinclair Lewis / Washington / Feb. 24, 1938". Publisher's blue cloth, stamped in orange; in the original blue and white dust jacket. Book near fine or better, with a hint of faint toning to the spine ends, Wallack's bookplate to the front pastedown, else fine; unclipped dust jacket, with professional restoration to strengthen to what Pastore calls the "absurdly fragile dust jacket" and repair the losses to the spine ends and front panel, some minor toning to the spine, light soiling to the front panel. Overall, a very good and attractive copy. Pastore 8. Lewis inscribed this copy of Babbitt to notable book collector Nathan N. Wallack from Washington, D.C. Babbitt, is Lewis' eighth novel that and established his reputation as a major American author. Just as Main Street (1920) criticized romantic conceptions of American small-town life, Babbitt satirizes urban life in America in the 1920s. Specifically, it tells the story of George F. Babbitt, a "hustling, prosperous real estate broker" in the fictional city of Zenith. An immediate bestseller, Babbitt's popularity was such that "babbitt" became a neologism for a person or businessman who unquestioningly conforms to middle-class standards of living. Notably, Babbitt played a significant role in Lewis' being awarded the Nobel Prize for Literature in 1930, making him the first American author to win the prestigious honor.. 1st Edition. Hard Cover. Very Good/Dust Jacket Included.
. 1 page of a bifolium. Octavo. Dated Mödling, near Vienna, June 17, 1922. With Schoenberg's address handstamped to upper left corner. In German (with translation). Schoenberg thanks Otto Freund, a banker in Prague, for immediately complying with his request to send money to Anton von Webern: "Without concern for the fact that he who gives soon gives twice, you have given the double amount-that is, fourfold-and you are announcing to mobilize others. That is very nice of you, and I am very glad to have taken the courage to turn to you [already] after such a recent acquaintance, and I see my trust rewarded in the most beautiful way." Creased at folds; hinged at upper edge with archival tape.. Unpublished (except for the incipit on the website of the Arnold Schönberg Center, Vienna). The present letter follows Schoenberg's first letter to Otto Freund, a banker in Prague, sent on June 9, 1922 (held at the Arnold Schönberg Center). In his earlier letter, Schoenberg had asked for finanical assistance for Anton von Webern, who at the time was in great financial need. Freund sent 250,000 Austrian crowns; see his letter of June 15, 1922 (at the Library of Congress). 1 page of a bifolium. Octavo. Dated Mödling, near Vienna, June 17, 1922. With Schoenberg's address handstamped to upper left corner. In German (with translation). "Without concern for the fact that he who gives soon gives twice, you have given the double amount—that is, fourfold—and you are announcing to mobilize others. That is very nice of you, and I am very glad to have taken the courage to turn to you [already] after such a recent acquaintance, and I see my trust rewarded in the most beautiful way." Creased at folds; hinged at upper edge with archival tape. . Unpublished (except for the incipit on the website of the Arnold Schönberg Center, Vienna). The present letter follows Schoenberg's first letter to Otto Freund, a banker in Prague, sent on June 9, 1922 (held at the Arnold Schönberg Center). In his earlier letter, Schoenberg had asked for finanical assistance for Anton von Webern, who at the time was in great financial need. Freund sent 250,000 Austrian crowns; see his letter of June 15, 1922 (at the Library of Congress). A WONDER BOOK Illustrated by Arthur Rackham. London, New York & Toronto, Hodder & Stoughton Ltd., s.d. (1922). In-8, bella legatura edit. in tela rossa con decoraz. oro, con la rarissima sovraccoperta orig. che porta applicata al piatto anter. una ill. di Rackham, risg. figur., pp. VIII,206,(2), molto ben illustrato dal grande artista inglese: sono testate, finalini e 24 pregevoli tavole f.t. di cui 16 sono a colori (applic. alla pag.) e precedute da una velina con didascalia e 8 sono disegni più o meno colorati. Questa importante edizione raccoglie 6 antiche leggende per ragazzi, rielaborate dallo scrittore americano Hawthorne (1804-1864) e precisamente: ? "The Gorgon? 's head - The golden touch - The Paradise of children - The three golden apples - The miraculous pitcher - The Chimaera?". Cfr. Benezit,XI, p. 376: ? "Arthur Rackham (1867-1939) fut surtout aquarelliste et a illustré de très nombreux ouvrages. Il a connu un considérable succès et son style est en accord avec celui de l? 'époque du symbolisme et de l? 'art nouveau?". Con qualche fiorit. ai soli bordi delle pagg., altrimenti esempl. su carta distinta, ben conservato. 1922. [PHOTO ALBUM - SIBERIAN EXPEDITION]. TWO ALBUMS OF 242 IMAGES OF THE SIBERIAN EXPEDITION, CIRCA 1920, AND 16 POSTCARDS Album 1 Patterned cloth , with a printed dancer pattern, over flexible boards, 27 x 36 cm, cord tie, a.e.g. 86 photos mounted on  ff. The photos range in size from 6 x 4 cm up to 10.5 x 15 cm, though most are somewhere in between, around 14 x 8.5 cm. Included are five panoramic views, 27 x 8.5 cm, that are formed by butting two photographs. The first four pages have Japanese captions written on the mount. Fourteen photos have Japanese captions printed within the image, and five photos have Russian captions printed within the image. Laid-in are 15 blank postcards, 9 x 14 cm, showing scenes from the expedition and a map. Nine in color plus six black and white. Album 2 Padded silk, woven with a cloud and dragon pattern, over boards, 27 x 35 cm, cord tie, a.e.g. 156 photos mounted on  ff. The majority of the photos are 8.5 x 13.5 cm, with a couple of larger photos that measure 14 x 19.5 cm, and three 27 x 8.5 panoramas formed by butting two photos together. 50 photos have Japanese captions printed within the image, while two others have Russian captions printed within the image, and another two are captioned by hand in Russian. These two albums contain photographs taken around the time of the Allied Siberian Expedition (1918- 1922). One depicts scenes of home life of local (presumably White) Russian people around Vladivostok and interaction with Japanese troops. This is the "soft" album, perhaps suitable for showing to civilians, to ladies, to the public. The other concentrates on Japanese military involvement in the Intervention and on the realities of life in Siberia during that turbulent period. There are scenes of disease, of starvation, of brutal death - both military and civilian, men and woman. This is the "hard" album that speaks to the bleak winter and even more bleak chaos and misery. It includes scenes of troop movement along the Siberian Railway with several images of sabotage and battlefield aftermath. Cervantes, Miguel de; Hasemann, Arminius. Don Quijote von der Mancha. Ritter der traurigen Gestalt. Zwanzig Holzschnitte von Arminius Hasemann. Berlin und Leipzig, B. Behrs Verlag, Friedrich Feddersen, 1922.. Groß-Folio. 2 Bll. und 20 signierte Orig.-Holzschnitte unter Passepartout lose in Orig.-Pergamentmappe mit goldgeprägter Deckelvignette.. 2. Werk der Kummerfels-Presse. - Eins von 110 num. Exemplaren, im Druckvermerk von Hasemann hs. signiert und mit seinem Stempel versehen. Hier eins der wenigen Exemplare der Vorzugsausgabe ("Außer der schlichen Halbleinen-Mappe werden noch einige Stücke in kostbarem Gewand nach Angabe des Künstlers ausgegegben."). - Schönes Exemplar.